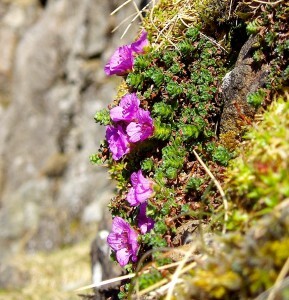 Purple saxifrage – a true mountain and arctic specialist. Purple saxifrage is a remarkable plant. It is the highest flowering plant in the European Alps, it is also the most northerly flowering plant in the world and is found across the northern hemisphere from Canada to Japan. What’s more you can see this plant at home here in the mountains of Britain and its bright purple flowers can be seen from February until May even as the snow is melting! 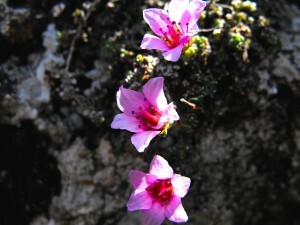 The underlying geology is an important tell-tale as to where to see this rare mountain plant in the wild. It is a reliable indicator of calcareous rocks and soil conditions (calcium and base rich) and can be found in rock crevices, on screes and on cliffs even along some well-trodden mountain tracks. It is found across the British Isles from the Brecon Beacons and Snowdonia in Wales, to Teesdale and Cumbria in England and on Ben Laws and Trotternish in Scotland. It even grows at sea-level in some areas of Scotland! Its scientific name Saxifraga oppositifolia derives from the Latin saxum meaning ‘rock’ and frangere ‘to break’. The many plants which share the name Saxifrage aren’t ‘rock breakers’ but they live amongst rocks and screes which are shattered and broken by severe cold temperatures releasing nutrients for the plants to take up through their roots. Its presence in Britain is testament to our glacial legacy. It forms one of our many relict arctic-alpine plants found at the very edge of their world distributions. It is a superb coloniser of land uncovered by retreating glaciers. In fact it is found on Lockwood Island on the north coast of Greenland, the most northerly location of any flowering plant on Earth. It is a true arctic-alpine species in the very sense of the term has been observed flowering in August at 4505m on the Dom in the Swiss Alps. 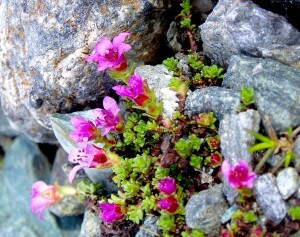 Despite the harsh and extreme environment in which the purple saxifrage lives it reproduces sexually by insect pollination rather than by vegetative propagation methods. One adaptation of this is that it flowers for a long time, about 2 weeks, which is a great benefit given the lack of pollinators (usually tiny flies). This cushion-forming plant can be identified by the early flowering of its penny-sized purple flowers. Its leaves form small rosettes along trailing reddish shoots. If you take a closer look you may even make out tiny white dots on each leaf tip which are secretions of lime. Its flowers are also edible and eaten by Inuits who enjoy the vitamin C rich sweet blossoms. The flowering also coincides with the calving of Caribou. Perhaps you will be fortunate enough to enjoy this botanical spectacle this year. Keep your eyes open as the presence of this species may also lead you to discover other species that form a window to our past glacial history. ← We’re wild about reading….